Sharpen your mower blades and tune up your mower (we recommend Aurora Lawnmowers, 7323 Aurora Ave Seattle, WA 98103). 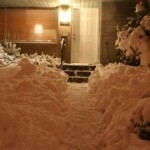 While you’re at it, try to stay off soggy or frozen grass to keep it from being compacted. Be sure to keep wet and soggy leaves from piling up on the lawn as they can smother the grass. It’s never too early to pull weeds. Get them early, get them young. Clean up landscape beds. Pull out or dig up annuals after they have been killed by a freeze and cut herbaceous perennials to the ground. With the beds clean and open, it’s a good time to top-dress landscape beds with mulch as long as the ground is not frozen. Now is a good time to plant or move trees and shrubs. Selective pruning of evergreen and deciduous shrubs and trees can be done at this time of year. Cut out deadwood, crossing branches, and branches that are damaged by storms.